For a hugely popular comedian to deliver one hilarious DVD is par for the course, to produce two very funny volumes is unusual, three is rare, a fourth almost impossible. 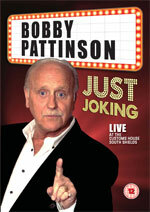 'Just Joking' is Bobby Pattinson's fifth helping of sidesplitting Geordie humour to be released on DVD. His previous DVD's have been filmed at the cream of the North East's venues and on this occasion the Customs House Theatre on the banks of the River Tyne in South Shields was the location. Bobby decided to set himself a challenge for this DVD so he took himself back to his early days and revisited jokes and stories he hadn't used for decades. The initial reason was curiosity, would the material he collected as a young man still work, would it make him laugh and most importantly, would his loyal audience go for it. If Bobby had any doubts they were allayed the moment he began his performance. Almost at once the audience was roaring with laughter at his quick-fire delivery peppered with one-liners,anecdotes and gags that celebrated the Geordie Nation's quirky and unique culture. Taking Bobby's track record into account, it was no surprise that the event was a huge success and the audience went home very happy. Now you can experience the whole rollicking performance at home when you watch this DVD. In recent years Bobby has been closely involved with the Variety Club of Great Britain and has been donating his personal appearance fees to the charity. To date he has been responsible for the purchase of three Sunshine Coaches which were presented to Dryden Road Special School, Cedars School and Hill Top School, all in Gateshead, Bobby's home town. Bobby has no intention of stopping there and your attendance at his future shows will help him bring more light into the lives of deprived children in the North East. Sit back and enjoy Bobby Pattinson, Just Joking, live at the Customs House, South Shields.